Schelby at 94.7 FM The Arrow just informed us that Bonnie Raitt won their 3rd annual "Top Ten Chicks Who Rock" poll today. Ms. Raitt will be here at Wolf Trap on July 3 and 5 with Keb' Mo' and you can hear Schelby weekdays from 9 a.m. to 2 p.m. on 94.7 FM in the D.C. area. In conjunction with our season announcement on March 23, we created the Wolf Trap Sounds of Summer 2006 iMix on iTunes, featuring tracks by 15 of the artists coming to Wolf Trap this season. 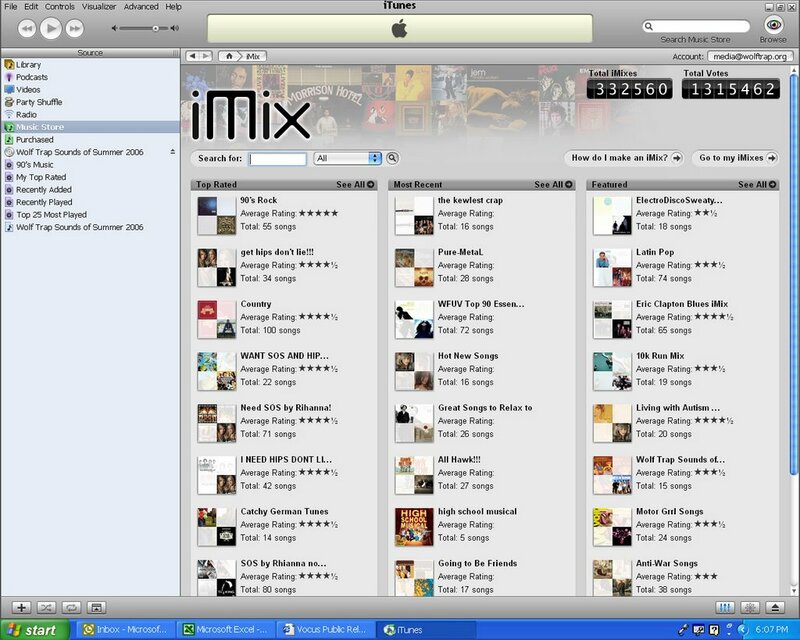 Yesterday, we discovered that our iMix is now one of ten featured on the iTunes Music Store, out of over 300,000 total iMixes. 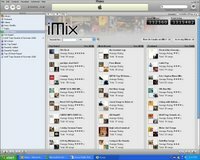 The Sounds of Summer 2006 iMix features songs by artists such as B.B. King, Bonnie Raitt, Al Jarreau, Sin Bandera, and others. Stay tuned for more Wolf Trap iMixes, including Sounds of Summer 2006: Volume Two coming soon. In the meantime, you can still win a copy of Sounds of Summer 2006: Volume One, as well as the iTunes album of your choice by one of the artists coming to Wolf Trap this summer. All you have to do is post something about our new Wolf Trap blog on your own blog. Once you've done that, post a comment here on our blog, letting everyone know that you just blogged about us. This contest ends next week, on Friday, May 5 at noon. Announced this morning on www.wolftrap.org, Grammy award-winners Train will perform at Wolf Trap on Monday, July 24. Tickets go on sale tomorrow morning at noon. As we gear up for summer at Wolf Trap, the 2005-2006 performance season at our indoor venue, The Barns at Wolf Trap, is winding down. But 10 Barns shows remain between now and May 6, so there's still time to catch one of those, and the Wolf Trap Opera Company performs there during the summer. *Sat., April 29: 19th Annual Evening of Comedy - 7 p.m. *Sat., April 29: 19th Annual Evening of Comedy - 9:30 p.m.
*These shows were sold out at the time of this blog entry. Keep an eye on www.wolftrap.org or call 703-255-1868 for ticket information for all shows. 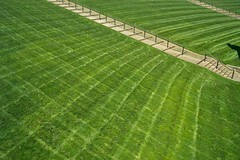 During lunch today I took a trip across the Dulles Toll Road from our offices here at the Center for Education at Wolf Trap and captured some shots of the Filene Center, including this one of the lawn right after a fresh cut. Tomorrow marks one month until the opening night of the summer season. To see more of the pictures from the Filene Center today, check out our new Flickr account. We'll be posting pictures there all season long. --Pollstar.com ran this piece on Fiona Apple's summer tour, which includes a stop at Wolf Trap. --Guster, who performed at the Jammy Awards last week, received a nice mention on Filter magazine's website about their upcoming performance on the Tonight Show with Jay Leno and their summer dates, one of which will be an August 1 Wolf Trap show. --Metroblogging DC helped get the word out about our new blog on Friday. --Tonight's Melissa Manchester show at The Barns was previewed by Emily Cary in Saturday's DC Examiner. --Friday night's Trio Solisti show was reviewed by Cecelia Porter in today's Washington Post Style section. The show had previously been picked as one of April's Best Classical Concerts by The Washington Post's Tim Page. --Finally, DCist gave this coming Sunday's Vienna Teng show a plug in their Weekly Music Agenda today. Welcome to the Wolf Trap blog. First, before we get into anything else, Happy National High Five Day and thanks to DCist for the reminder this morning about this excellent holiday. This Wolf Trap staff blog has been in the works for a little while and today seemed like a good day to officially launch it. Visit Wolf Trap Live throughout the summer for a firsthand account of the nearly 100 shows coming to Wolf Trap this summer and other inside information from the Wolf Trap staff. We'll be blogging here all season long, providing music fans, bloggers, and journalists, with updates on what's happening at Wolf Trap, including things you might not normally read about in the news or see on our official Wolf Trap website. Tickets to summer shows at Wolf Trap's Filene Center went on sale to the public on Saturday, April 1 and the season kicks-off on Friday, May 26 with A Prairie Home Companion. Also, on Sunday, May 28, you can enjoy fireworks and a FREE concert by the U.S. Marine Band--no tickets are needed for this show. Four news shows were announced this past Monday: Fiona Apple on July 31; Guster and Ray LaMontagne on August 1; the Bob Marley Roots, Rock, Reggae Festival 2006 on August 27 with Ziggy Marley, Stephen Marley, Sinéad O'Connor with Sly & Robbie, and Ozomatli; and Chris Botti on September 6. Tickets to these shows go on sale this Saturday, April 22 at noon. Wolf Trap is currently running a contest, where one winner will get two lawn tickets to every show this summer. So, that's two tickets to almost 100 shows, that you can enjoy on our lawn, where you're allowed to bring your own food and drinks (even beer and wine). Enter the contest by sharing your favorite Wolf Trap memory at wolftrap.org before May 1. All you have to do is post something about our new Wolf Trap blog on your own blog. Once you've done that, post a comment here for us, letting everyone know that you just blogged about us. We'll then pick our three favorites and give them the Wolf Trap Sounds of Summer 2006 iMix, as well as the iTunes album of their choice by one of the artists coming to Wolf Trap this summer. This contest ends next week, on Friday, May 5 at noon.